Florida Lighthouse Association, Inc. - JOIN TODAY! Become a Member ~ Help save Florida's Lighthouses! FLA is a nonprofit membership organization. Members play a critical role preserving, restoring and protecting Florida’s remaining 29 historic lighthouses and educating the public. Free admission, by showing your membership card, to six Florida lighthouses: St. Augustine, Ponce Inlet, Jupiter Inlet, Crooked River, Cape St. George and Pensacola. Are you single? A student? This membership category is for you. Individual memberships are entitled to one vote at regular meetings. If you are a married couple or have children at home then this membership category is right for you. Family memberships are entitled to one vote at regular meetings. Corporate memberships are entitled to register two people as individual members. In addition, you may post a logo and link on FLA's website. Corporate memberships are entitled to one vote at regular meetings. 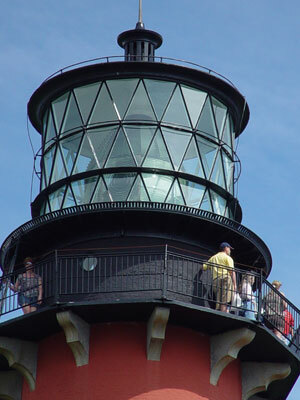 Official local lighthouse preservation groups are members of FLA and each has a seat on the Board of Directors. These groups work together in efforts to preserve all Florida lighthouses through their involvement in FLA. Please note that there is an additional registration fee for FLA meetings, programs and lighthouse tours.